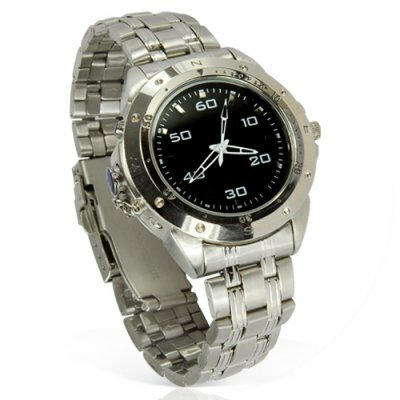 Successfully Added Stylish Watch with Stainless Steel Strap (Surveillance DVR) to your Shopping Cart. Stylish watch with all round metal strap for surveillance video recording without anyone knowing. This new model comes with a beautifully textured stainless steel strap that easily adjusts to fit your wrist comfortably. With 8 GB's of built-in storage capacity, it has never been easier to record hours of surveillance in computer ready AVI format. This is the best way to record all your encounters, interviews, meetings and on the scene discussions without anyone knowing what you are doing. If you have ever had to spontaneously run into a meeting or had a sudden encounter with someone that just needed to be caught on camera, now you can instantly and secretively record that conversation for later viewing. This model offers you the chance to record both video and close range audio simultaneously. This is an elegant DVR " watch" solution for both ladies and gentlemen! The camera is beautifully disguised, no one will ever suspect being spied upon at all. This " watch" type micro video camcorder with its sophisticated design that makes it look like a modest priced designer watch. This model works just like a real watch, and comes with accurate gear driven time in seconds, minutes, hours and a twisting crown for time adjustment. Imagine the candid video with close range sound that you can take without anyone ever being the wiser, and proudly show off to your friends your new "designer" watch. Place your order today for one watch for yourself and then order in bulk for even greater wholesale savings that make this a high profit re-sale item for eBay, Amazon, or your own physical/internet store. What is the best recommended range for audio recording? To record clear audio, the closer the better, works great for interviews, and records best within a range of 3 meters. How do you know when you are recording? To record, hold down the button on the top left for 2 or 3 second, and you will notice a small green LED light indicating, that is when it is in recording mode. How do I stop recording? Follow the same procedure as when you need to record, hold down the button on the top left and you will see the LED indicator flicker RED and switch off. You will have then stopped recording. How many hours of footage can I store on the 8 GB's of flash memory? The camera wrist watch can store up to 14 hours of video with audio.